Gluten-free apple crisp with a generous layer of oat and oat flour based topping! With a vegan and dairy-free option. See the bottom of the post for a video. First of all – if you’re after a grain-free apple crisp, check out my vegan and paleo apple crisp! Today’s gluten-free apple crisp is a much more traditional version with oats and oat flour making up the topping. Because it’s oat-based, it’s both gluten-free and 100% whole grain. 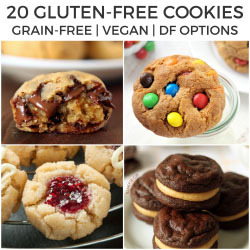 Make sure to use gluten-free oats and oat flour if you need the crisp to be gluten-free. And if you don’t have oat flour on hand, you can whirl some quick or rolled oats in a food processor, high-powered blender like a Blendtec or Vitamix or an electric coffee grinder until it’s very fine and powdery. My favorite way for small amounts is the coffee grinder. Then the high-powered blender. Those both get the oat flour really fine. If you have a large food processor, you’ll probably need to grind more oats than you need for this recipe to get it to grind the oats finely enough. And even then, the oat flour won’t be as fine as with the other two methods. But it’ll still work! I have a large food processor and need at least a cup or two of oats to even get it over the blade. If you’re wondering what to then do with all that oat flour, you could try my gluten-free banana pancakes. My walnut chocolate chip cookies and Swedish apple pie, which are both gluten-free + vegan, would also be excellent choices! But back to this crisp. You can use butter or for a vegan and dairy-free version, coconut oil. Every time I make this gluten-free apple crisp, I wonder if I’m making a mistake while putting on the topping. The recipe calls for an 8″x8″ but I start wondering if I wrote down the wrong pan size. There’s SO much topping! But it always works out and once it bakes, it doesn’t turn out to be an absurd amount of topping. I think it’s just perfect. No crisp would be complete without a little extra something on top! I highly recommend this maple ice cream for the dairy-eaters or this paleo and vegan vanilla sauce. Wanting something a little different? Try these cinnamon caramel apple energy bites or these baked apple cider donuts (both of which are also gluten-free)! Adjust oven rack to lower third of the oven. Preheat the oven to 350°F (175°C) and get out a 1-quart (1-liter) casserole dish or an 8 × 8-inch (20 × 20 cm) baking dish. In a medium mixing bowl, mix together all of the topping ingredients. It might be quite wet. Prepare the apple filling. Place the chopped apples in a large mixing bowl and then sprinkle the remaining ingredients on top. Stir to coat the apples in the liquid mixture. Spoon the apple mixture into the pan and distribute the topping evenly over the top. It'll be a thick layer of topping. Place the crisp on a baking sheet to catch spills and bake for 30 to 35 minutes or until the topping is firm and the edges are bubbly. Let cool for 1 hour, which will give the juice some time to thicken a little. Serve warm, room temperature, or cold, with vanilla or maple ice cream or vanilla sauce. 17 comments on “Gluten-free Apple Crisp (vegan, whole grain)” — Add one! Favorite fruit? Apples! And this is one of my favorite recipes – thanks for sharing! I just bought some apples at the grocery store. Will be using them to make this apple crisp! Looks so tasty! I made this tonight and used 2 large apples and 2 red pears and it was amazing. I followed the recipe exactly and got an amazing caramalized inside and crunchy topping. Everyone make this! Going to have to make some oat flour this weekend and give this a try! I’ll be right over. Save me a giant slice. This looks incredible. I love fruit crisps and your oat topping looks and sounds so delicious! I love how easy it is to make too! I looove crisps and using oat flour for the topping is absolutely perfect! Oh yum, this crisp is pretty much everything! Perfect for this time of the year! This looks so good – I could just dive right in! This is such a perfect Fall dessert!! I seriously want some of this! This is perfect for Fall. I’m so glad it’s apple crisp season!!! I love your oat topping—and the more, the merrier!!! I love lots of topping! It’s the best part!